I was so tired last night that I did not do any preparation for breakfast. I did not even give a thought on what I should be making. Not a good thing considering my mornings are like "hurry"-canes. I'm in a hurry to do everything, all because I keep snoozing my alarm. Every day when I'm running to catch my bus, I decide that tomorrow I'll wake up just 10 minutes early, so I can walk gracefully to my bus stop well before the bus arrives and the very next day I'm again running down the stairs and the road, hoping the bus hasn't left me and gone. Luckily for me, I did not snooze my alarm till eternity and I woke up with enough time to actually cook something for breakfast. I made my quick-fix yet delicious Beetroot Chickpea Pancake. I love beets, have done so forever. What's not to love, it is so earthy and vibrant and sweet. Although they are sweet, I've rarely ever made desserts with beet root, I'm more for adding them in savory dishes. 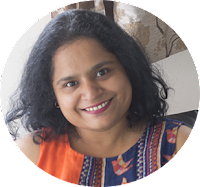 I make beetroot sambar - a spicy South Indian curry made with beets, coconut and lentils or I make a dry grated beetroot curry that goes really well with roti. I started making this Beetroot Chickpea Pancake when I used to have leftover beetroot in the fridge by the end of the week with no idea what to do with something as little as one single beetroot. Now I sometimes buy an extra beetroot just so I can make these Beetroot Chickpea Pancakes. I hate to say this, but this is such a Girly Breakfast... Nothing to do with the taste, the taste is nothing girly or boy-ey but look at that vibrant pink and tell me it does not make that little girl in you shout with joy. Pink was my favorite color as a kid, well, that's what I told others. Secretly, it was yellow. But Pink came a close second. To make this vibrant quick breakfast, all you need is chickpea flour or besan, grated beetroot, chopped tomato, some greens like curry leaves and coriander, chilli flakes, cumin seeds, semolina, baking soda, salt and water. Mix everything well to remove any lumps. Spread on a greased hot griddle and flip when one side is cooked. Serve it up with chutney, yogurt or plain butter. Tastes amazing when hot, but room temperature will do too. If your heart beats for "beets", you'll love this one. Tomato Omelet - Instant pancake made from chickpea flour or besan and tomatoes. 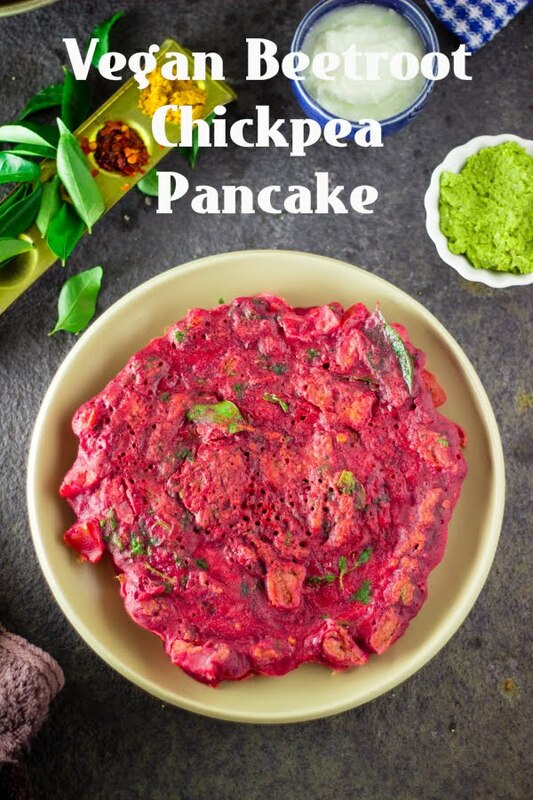 Beetroot Chickpea Pancake is an instant vegan breakfast made from grated beets and chickpea flour or besan. In a large bowl mix together the chickpea flour, semolina, grated beetroot, finely chopped tomato, chopped coriander, chilli flakes, cumin seeds, curry leaves, salt, baking soda and 1 cup of water. Mix well until there are no lumps. Add more water if required. The consistency of the batter should be thin enough to spread. Heat a griddle / tava or a flat frying pan and grease it. Pour a spoonful of batter onto the griddle and spread it out into circles. Cook on low to medium heat until one side is slightly browned. Do not allow it to char or burn. Spoon a little oil on the top and flip it. Cook the other side for 45-60 seconds or until cooked. Serve hot with chutney, yogurt or butter.